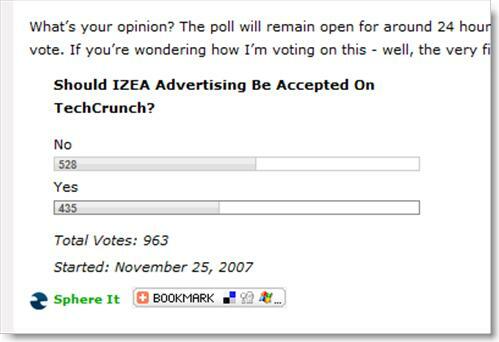 Should IZEA advertisements be accepted on Techcrunch? They (PayPerPost posties) are the blogging worldâ€™s pariah and are fairly routinely trashed for, as I put it, polluting the blogosphere. Michael Arrington is an influential blogger whose words can make or break a company. He is very vocal and he hurls names all the time. I am so used to it. However, in the beginning I do stand up for PayPerPost because I earn good money from PPP. PPP *was* like an employer to me. Michael Arrington had been calling people like you and I who write for PayPerPost all sorts of names. Meanwhile, Ted Murphy is this flamboyant, loud, over the top, CEO of PPP. Everything PPP did, it has to be LOUD. REALLY, REALLY LOUD. You know…the American kinda LOUD. That video was shot November 30th, 2006. My video left a big question mark, in the war between PPP and Google, who will win? It is kind of funny that one year later, I don’t sing the same tune that much. Because the victims are us, the bloggers. Though I have no problem being in the PPP network, I guess I have now ‘grown up’ and have detached two of my prime blogs from PPP. One more is in the process as well. Mind you, by prime, I mean having RealRank of below 40 and 50 (which is an impressive figure). Now, my dear friends, go to Michael Arrington’s post here on Techcrunch and vote. If you can get enough posties to vote for IZEA to win, then, IZEA advertisements will appear on Techcrunch. This way, life will be less miserable. If IZEA lose, IZEA and the posties will have to forever hold their peace and let every sides to diss them endlessly. As usual, Ted has taken a big gamble, at our expenses.